TOUR GUIDE RESPONSE: Dear Rubinsteins thank you for the marvelous words, I very much appreciate it :) I am glad you liked Bratislava and wish you a very good test of the tour, good way home and beautiful memories. Eva was very knowledgeable about the history, politics and geography of Bratislava and Slovakia. She was very patient and was never in a hurry. She was funny and even kept the kids engaged. We were a large group and we only had one day in Bratislava, and thanks to Eva we got to see most of the important landmarks in Bratislava. Everyone in the group was happy with Eva. I would highly recommend Eva as a tour guide, and I assure that you won't be disappointed. 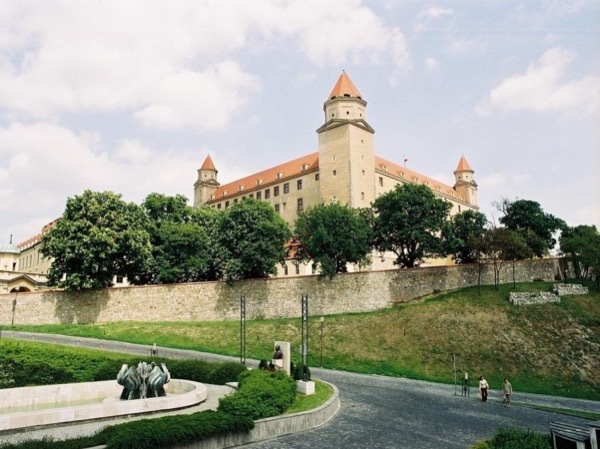 My husband and I booked a private 3 hour tour of Bratislava with Eva on July 7, 2018. We loved the tour! Eva grew up in Slovakia has lived through the communist era and the post-communist transition and she provided a lot of interesting insight. She speaks several (?6) languages fluently including English. She is a spunky lady and has a funny sense of humor. Highly recommend Eva and the 3 hour tour. Eva was a wonderful and delightful guide. She presents the history of Bratislava in an unrushed and thorough manner that you even seem to forget how much ground you are covering in her tour. What I found most enjoyable were her anecdotes about growing up in Bratislava to add some special personality to the city as well as a way to illustrate the tensions between economic change in the city and efforts at "historic preservation." Well-informed, pleasant guide. Delightful sense of humor. Knows her Slovakian history! A brilliant, brilliant tour. Eva was very well organised and encyclopaedic in her knowledge. Our group of 8 loved her sense of humour and we came away not only feeling we'd seen the historical landmarks of Bratislava Old Town but also with an understanding of the country's more recent history. This kind of insight is invaluable - you won't get it from guide books or bus tours! I very much enjoyed my tour of Bratislava with Eva. She was gracious, prompt, and met me in the lobby of my hotel. If you have time, however, I would recommend doing the longer tour. I chose the 1 hour short tour and it just wasn't enough time for me. Eva did her best and shared as much knowledge about Bratislava as she could in 60 minutes. Thank you! Eva was very knowledgable and answered all of our questions. She loves her city and it comes through! Eva was an excellent guide. She is very knowledgeable about Bratislava and the surrounding area. We used her as a guide for three hours. She has a very interesting background and shared insights with us about her experiences growing up under various political conditions. We would highly recommend Eva as a guide. Eva provided the ideal tour of Bratislava's old town. I can't imagine anyone having a more comprehensive knowledge of the town's history, and Eva has a very pleasant demeanor. The tour really made our trip to Bratislava, and Eva was happy to focus the tour on the things most interesting to us. Eva was a wonderful guide and we really enjoyed our tour. We especially enjoyed the insight to everyday life in Bratislava. Highly Recommend! This is one of the best tours my family has ever been on. Eva was a great tour guide and provided us with endless information on the city of Bratislava. She was great to work with and gave great recommendations on where to get traditional Slovakian food, to take my family back to our heritage. Bratislava is a beautiful city and Eva taught my family so much about. If we ever went again I am sure we would book a tour again! Saying that our tour with Eva made us fall in love with Bratislava is an understatement. We toured with Eva on Dec. 26th and, as in most parts of the world, it was unusually foggy all over. While initially disappointed that we couldn't see anything from the gorgeous hilltops, Eva made up for it by giving us vivid accounts of what we were missing because of fog. Her knowledge, love and passion for sharing and showing off her hometown is infectious. She is funny and speaks perfect English! Eva gave a wonderful tour. She was a very insightful guide, and we thoroughly enjoyed the day! Eva was very accommodating to us, as she changed a tour date when we had transportation problems, taking part of her holiday to guide us around. She was helpful, friendly, and organized...making prior arrangements for a private taxi so we could see more of the city. Sharing her own background and experiences deepened our understanding and made our visit to Bratislava and Slovakia even more meaningful. I enjoyed my time with Eva. She's a sweet lady who is very patient and knowledgable. I was running a bit behind schedule, but she was very understanding. Our tour was interrupted by heavy rain, but she had the flexibility and calmness to finish the tour smoothly. I was happy she spent some extra time with me after the tour, for a light dinner and tea, as I was traveling alone. She is like a nice auntie who you can talk to and enjoy a peaceful evening with. I recommend her services. Eva was a wonderful guide, I would always recommend her. She shared all the knowledge with passion and interest.. it was a great 3 hours and we learned so much. Eva has been great. Very friendly, has estdo all watching us and our needs while. He has a great knowledge and explanations are very entertaining. He speaks Spanish very well. It is a very good choice for visiting the city. Eva took us to several interesting places in Bratislava that were not on the overview tour arranged by our cruise vessel. She showed us the Blue Church, the observation deck on the New Bridge, the Slavin Memorial, and St. Martin's Cathedral. Eva was very knowledgeable and gave us lots of in-depth information for each of these places. Highly recommended. We had very limited time to spend in Bratislava, and the tour was ideal for the situation. Eva is very knowledgeable guide, she loves her city and, on top of everything else, she is a very nice person. I strongly recommend this tour and this guide to anybody, who, like us, enjoys visiting new places. Eva was infomative, interesting and very personable. All of us enjoyed the tour very much and added great value to our visit to Bratislava. Eva was amazing. She is a wealth of knowledge of Bratislava and Slovakia. She customized the tour for us and we saw many things. Unfortunately we had to cut our tour a bit short but never felt short changed at all. All in our party highly recommend her. She even helped us with getting tickets back to Vienna via the water catamaran. (This was a great choice, views and change of scenery from train were highly welcomed.) If you go to Bratislava Eva is the best choice. I appreciated the attention to my questions and special wishes and received a very nice introduction to the city on a short time! N.
Our family spent a fairly chilly late December day with Eva and the tour was superb! With her humor and historical knowledge, Evy showed us the city in a way which kept a 10-yr old interested and the adults laughing and learning. Bratislava is a beautiful city, but we would only have seen the "postcard" version without Eva's help to see beyond. Highly recommended! Eva was wonderful and gave us a perfect day. I have no suggestions for improvement be cause you canot improve perfect!